Turkish President Recep Tayyip Erdoğan on Monday took jabs at former ruling Justice and Development Party (AKP) officials who are reported to be in the midst of establishing a new party and accused them of betrayal, independent news site T24 reported. "It was good when we assigned roles to some of our friends who we set out [on this political journey] with, but then certain times arrived when we said ‘Come, take some rest and let us assign someone else,’ and we see that they have gotten off the [AKP] train and on board another one… Those who betray us today will betray the place they go to in the future," the Turkish president said during a rally for his ruling AKP ahead of the March 31 local elections in the central province of Tokat. Erdoğan’s statements arrive amid increasing reports of former Prime Minister Ahmet Davutoğlu, along with ex-AKP deputy Selçuk Özdağ, among others, forming a new right-wing political party. Local reports indicate the party is nearing the end of political organisation in 40 provinces throughout the country. Davutoğlu, a former professor of political science and international relations, served as prime minister from August 2014 until May 2016, when he was forced out by President Erdoğan. 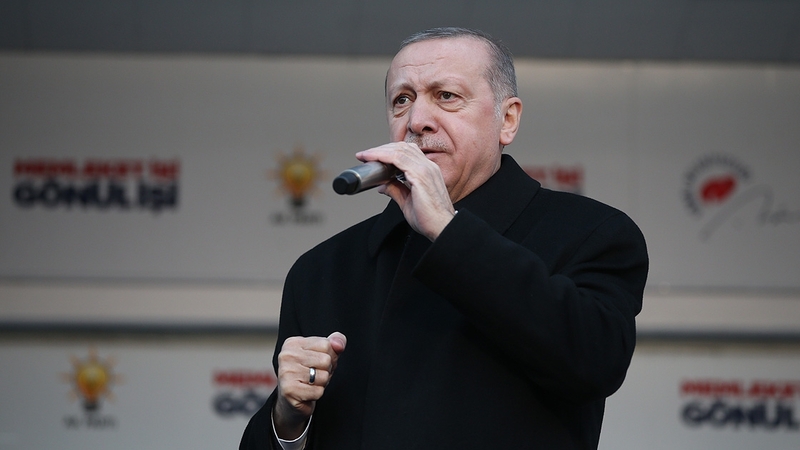 Erdoğan told the crowd in Tokat that he believed they would give parties’ which are deserving of a lesson, a strong message at the polls on March 31. "Bu kader birliği değildir bu dava birliği değildir"